By Bob Hurt. Designed to sit against a wall or at the foot of a bed. 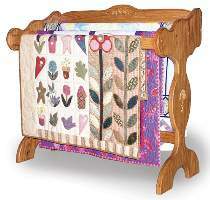 Displays up to three quilts. Patterns drawn FULL SIZE. Measures approx 35"H x 36" inside width x 18-3/4"D. Order one #2044, and two #2046 embossed oak ornaments separately below.